Here in Oregon, we have some of the most interesting landscapes and architecture in the country. Portlanders pride themselves on being individuals; thinking outside the box and being creative. Our Oregon homes, businesses, backyards, and outdoor spaces reflect the cool culture that is uniquely Portlandish! The local properties our outdoor lighting design company services often vary from the charm of rustic old homes to sophisticated, ultra-modern, contemporary and even modern architecture. These incredibly unique landscapes around Oregon provide our lighting company the opportunity to design landscape lighting solutions that are truly unique and amazing to see every time our LED fixtures light up the night. With this project, we were asked to create a special landscape lighting design in Maywood Oregon for a Japanese style garden and the paved walkways that run through it. The end result was a beautiful retreat from the ordinary. 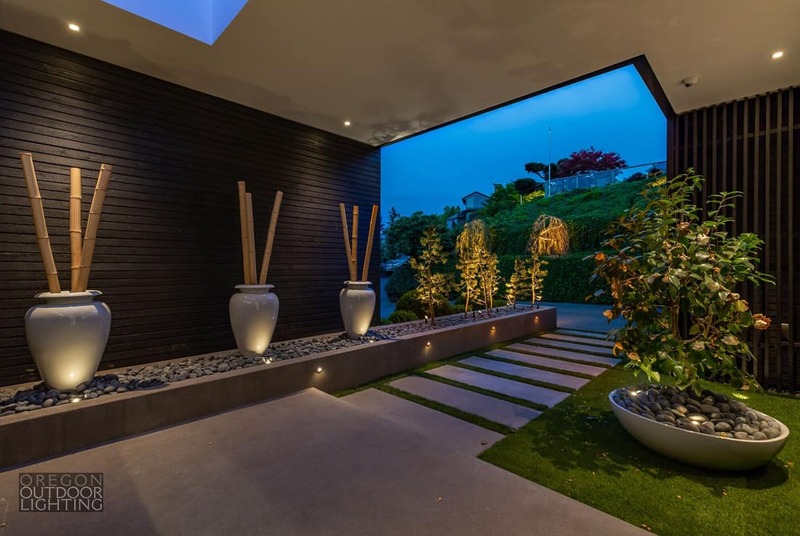 When walking through the garden at night, the soft and vibrant LED lighting creates a peaceful and calming atmosphere for the owners and their guests. This Maywood lighting design project provided a wonderful place to take an evening stroll or to simply sit and relax through the night. This Delenka Lake Oswego property included multi-level decks and stairs that led to a large backyard with beautiful landscapes. For this lighting design project in Lake Oswego, we wanted to add both beauty and safety to the walkways and steps. We wanted our lighting design customers home residence to benefit from a well illuminated outdoor area to enjoy anytime at night without fear of tripping or falling. Our professional lighting design and installation company worked to create dramatic lighting effects on the decking and also throughout the yard for extending its use and providing hours of enjoyment into the evening hours through the dark nights. In the Pacific Northwest, particularly Oregon and Portland itself, we care a great deal about the environment and work hard to effect good practices when it comes to conservation. After all, we live in the lush Oregon country where we aim to protect and preserve our energy while making it look great. As professional Oregon lighting designers and installers of LED lights, not only do we add beauty and safety to the homes and businesses we light up, but we also save energy and reduce the costs of lighting up the nights for our clients. Our energy efficient lighting designs feature low voltage lighting fixtures that last our customers a lifetime. Our landscape lighting company uses the most durable led fixtures available in the USA with elegant high quality craftsmanship. Our lighting design fixtures include a 20 year warranty and are built to stand-up to all types of harsh Oregon weather; including rain, snow, dampness, heat, cold and the quick changing seasons. Our outdoor lighting systems are also the most energy efficient fixtures made and will only draw a fraction of the energy of standard light bulbs keeping our customers design projects cost-effective for the life of their install. So it’s true, you can have a beautifully lit home, garden, business, deck and outdoor hardscape area with landscaping shining all night without worrying about being an energy resource hog. We would love to come to your home or business and do one of our signature nighttime demos. Our experienced designers and installers will be happy to show you what a well-thought-out lighting design can do to improve the safety, security, and beauty of your property.